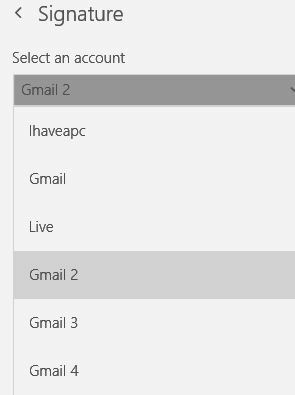 Using the Windows 10 Mail app is a very convenient way of managing multiple email accounts from a central interface. By default, the Mail app comes with its own default email signature. 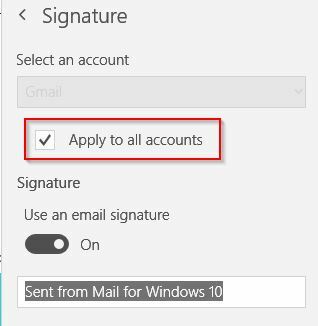 These preferences can be changed if needed so that either there is a common signature for all the configured email accounts, different signatures for each of them or no signature at all. From the bottom left of the app, click on the gear icon to access Settings. 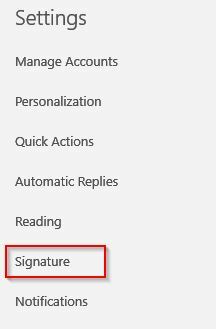 To set a common signature or to turn it off completely, select Apply to all accounts and enable/disable Use an email signature. To set different signatures for each of the accounts, choose the accounts individually from Select an account and enter the new signature in the text field.